Peter Morgan batted well for Bourne. Bourne skipper Peter Morgan did his best . . . but it wasn’t enough to earn his side a win in the Lincs Premier League yesterday (June 30). Bourne were at Sleaford and their innings got off to a terrible start as they lost two wickets for four runs in the first seven balls. Morgan dug deep and made 95 before the visitors were bowled out for 176 in 45.1 overs. The next best was Robert Dunn with 25. 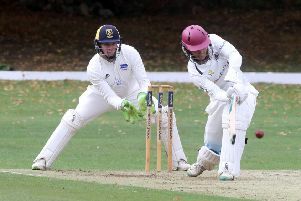 Sleaford then cruised to 179-2 in 34.1 overs for an eight-wicket win. There was better news for Market Deeping, who won at bottom club Grimsby in a low-scoring affair. Mehul Adatia (5-40) took five wickets as the home side were bowled out for 103. Market Deeping went on to win by three wickets.